This year’s Superkarts! USA SuperNationals event will have a distinctly Australian flavour with 35 drivers from ‘Down Under’ making the trip to Las Vegas in America for this weekend’s event. Held on a temporary circuit adjacent to the Rio All-Suite Hotel and Casino, this year’s 22nd running of the SuperNationals has attracted more than 500 entries from no less than 33 countries. Australia has two drivers defending the crowns they won in 2017 with Queenslander Kris Walton returning in the X30 Masters class while Sydney-sider Joshua Car, who is this year based in America competing in the US Formula 4 Series, will defend his X30 Senior title. Western Australian Kip Foster has been a front-runner at the event for numerous years and is a two-time winner, he and Walton are among seven Australians on the X30 Masters entry list. Car will also have six fellow Australians in his X30 Senior field, including 17-time Australian Champion David Sera who is making a return in 2018. 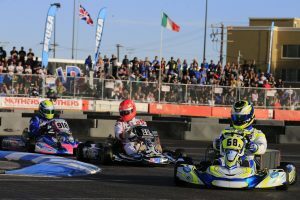 Former Australian Champions Joshua Fife and Troy Loeskow are two of four Australian drivers lining up against the best KZ drivers. They will be joined on the grid by Kye Cavedon and Jac Preston. This weekend’s event sees the IAME KA100 engine make its SuperkartsUSA! debut with the KA100 Junior and Senior classes taking to the circuit. Five drivers will be flying the Aussie flag for the Junior drivers while New South Wales driver Oscar Priest and Western Australians Scott Foster and Jake Sawyer will line up in the Senior ranks. Australian Cadet 9 Champion Lewis Francis will lead the charge for the three Australian youngsters in the Micro Swift class while Aiva Anagostiadis is expected to do the same in Mini Swift. Queenslander Jason Faint has proved to be a contender in the Master Shifter class over the past few years having started on the front row of the final previously, he will chase the elusive winner’s trophy this weekend. James Wharton, who has spent the past seven weeks competing in Europe, will complete double duties lining up in both the X30 and KA100 Junior classes. Practice for the event begins tonight (Australian time), a full schedule can be found by clicking here.